Hyper Microsystems is a privately held company which was established in 1996. We stock inventory consisting of over 35, 000 SKUs in a wide range of televisions, consumer electronics, hardware and computer products categories. Sell name Brand Consumer and Hardware Products such as LG, Proscan, Samsung, Magnavox, Westinghouse, Sylvania, Igloo, RCA, Steel Series, ETQ, Duracell, Vizio and many more. For customer service inquiries or to initiate a return, please contact Hyper Microsystems at questions at web@hypermicro.com or 800-278-5250 option 1. Super-Size RCA LCD Projection Panel and Super Bright LED Projection Lamp deliver an enthralling movie theater or gaming experience in the comfort of your home or backyard! 3.97 Projection LCD - 98% larger than similar compact projectors, delivers stunning, razor-sharp images and true-to-life colors. Up To 150" Picture Size - Super Size Projection LCD combined with Super Bright LED Projection Lamp provides an immersive experience viewing sports, movies, and games. (30" to 150" Maximum Picture Size and 37" to 100" - Optimal Picture Size ). Supports 1080p (as well as 1080i, 720p, 576i, 480p, and 480i) via HDMI Input. Native Resolution 800 x 480. .
Super bright 2000 Lumens Color Brightness and 2000 Lumens White Brightness deliver vivid colors, whiter whites, and blacker blacks. Projection LCD - 98% larger than similar compact projectors, delivers stunning, razor-sharp images and true-to-life colors. 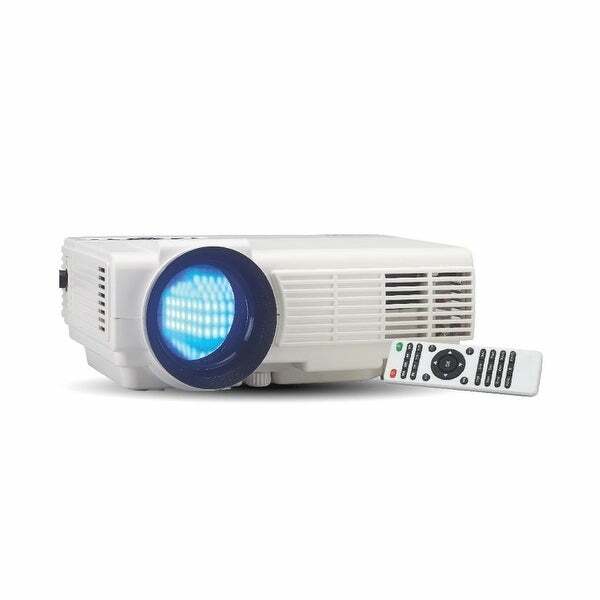 Up To 150" Picture Size - Super Size Projection LCD combined with Super Bright LED Projection Lamp provides an immersive experience viewing sports, movies, and games. (30" to 150" Maximum Picture Size and 37" to 100" - Optimal Picture Size). Projects images from 30"-150" on virtually any flat surface - screen, wall, ceiling, side of a house, etc... 50,000 hours estimated LED Projector Lamp Life - that is 22.8 years viewing 6 hours a day or 5.7 years viewing 24 hours a day!!! Best picture was at night of course. Remote doesn't work-new batteries. Returning because when I plug in the power cord there is a spark- I feel that it's very unsafe, worried it may start a fire.